Steve Bragg was already in jail awaiting trial, charged with the second-degree murder of Victoria Head, when he was handed an unrelated charge for defrauding a woman two months before Head’s killing. Bragg is accused of killing Head, 36, in November. Her body was found in a field near O’Brien Farm Road in St. John’s. Now, he’s been charged with defrauding a woman of more than $5,000 in September. The homeowner told police she gave him a down payment to do renovations last fall, but he failed to complete the work. He is set to go back to court on that fraud charge in March. A hearing will be held in May to determine if there’s enough evidence for the 36-year-old Mount Pearl man to go to trial on the second-degree murder charge. Read the full story over at CBC News. 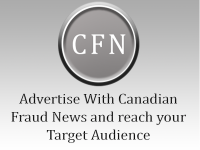 This story was summarized by Canadian Fraud News Inc.